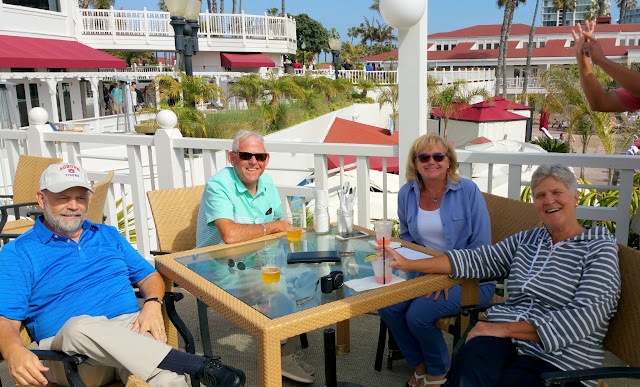 From Chula Vista Resort and Marina, Chula Vista, California Easter, like most holidays, comes and goes without much notice for Wayne and me. 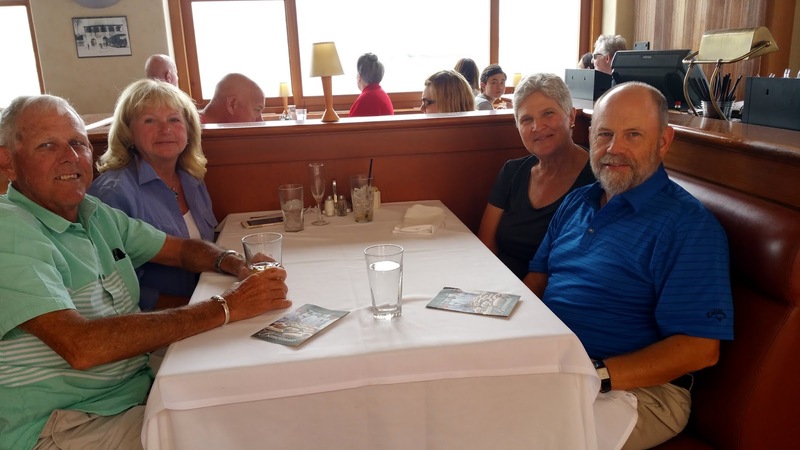 This year though, traveling with Pam and Ernie necessitated marking the calendar, selecting a restaurant, making a reservation and dining in celebration... complete with mimosas. Our restaurant selection would be a place recommended by friends we'd made in Cathedral City in February. Bob and Mary Ellen raved about Il Fornaio, an Italian fine dining establishment on Coronado Island and they weren't wrong. All four of us ordered brunch and every bite was delicious. Easter Sunday was nice, though it began on a sad note. Pam and Ernie had planned to attend church but late on Saturday night, they got word that a good friend had died. By Sunday mid-morning, phone calls were complete and their decision not to fly home was finalized and there was nothing more to do except continue with the Easter plan. 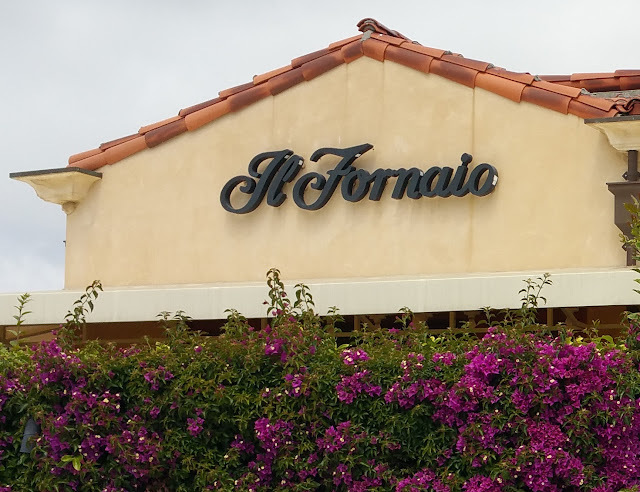 After brunch at Il Fornaio, Pam and I rushed outside to snag whatever photographs we could manage around the property, situated along the water's edge. Most weren't so good -- this is the best of mine, complete with strangers photobombing the set. 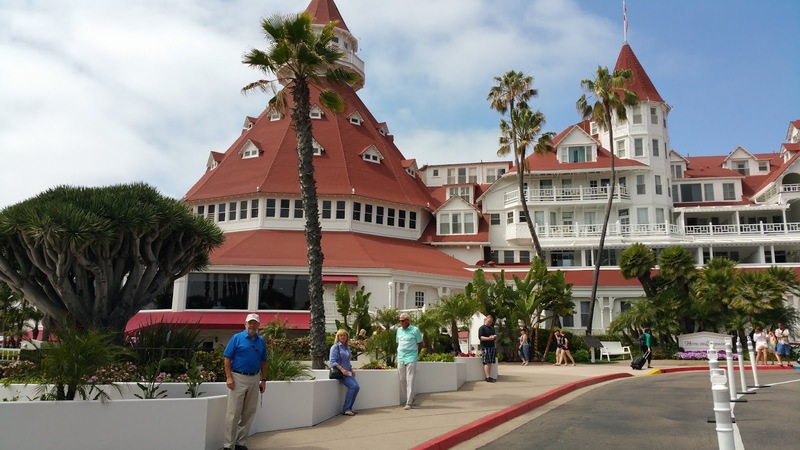 Next stop would be to explore Hotel Del Coronado. Easier said than done. Parking anywhere on Easter Sunday would be challenging, but parking here on Coronado Island was a nightmare. Hotel Del Coronado from the city street. 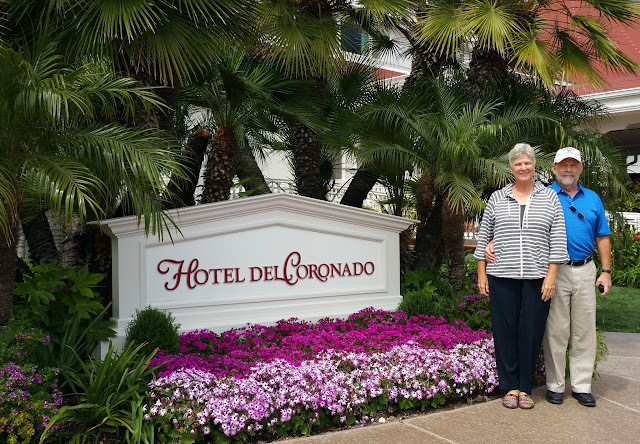 In the end, we parked in one of the hotel's parking lots for a fee of $30 which would be waived when we presented receipts totaling $50 or more spent on the property. Heck, we can drink $50 easily. In we went. Left to right: Wayne, Pam and Ernie. The others aren't my people. 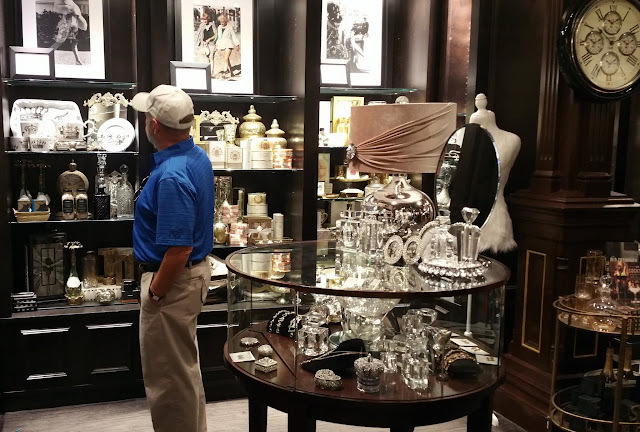 Naturally, we would need to take a few minutes for photos at the entry before spending at least a half hour waiting in the ladies restroom line and perusing gift shop wares. I bought n.o.t.h.i.n.g. After window shopping, we visited the 1888 store to see the old photographs displayed there. 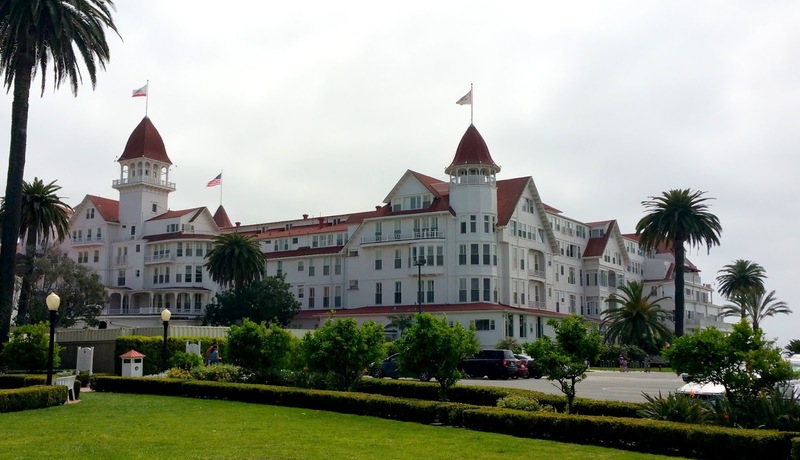 Hotel Del Coronado was opened in 1888 and was, at one time, the largest wooden structure in the world. 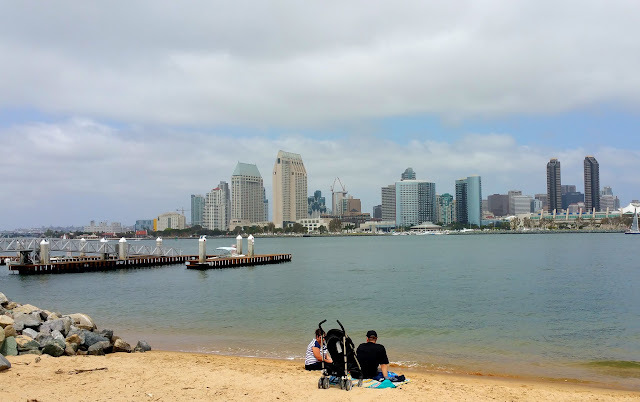 Of course, Wayne and I are fascinated by it mostly because it has played starring roles in several old movies.... our favorite, naturally, being "Some Like It Hot" with Jack Lemmon, Marilyn Monroe and Tony Curtis. Impossible to make out here but the old photographs are of "Some Like It Hot" stars while not filming. 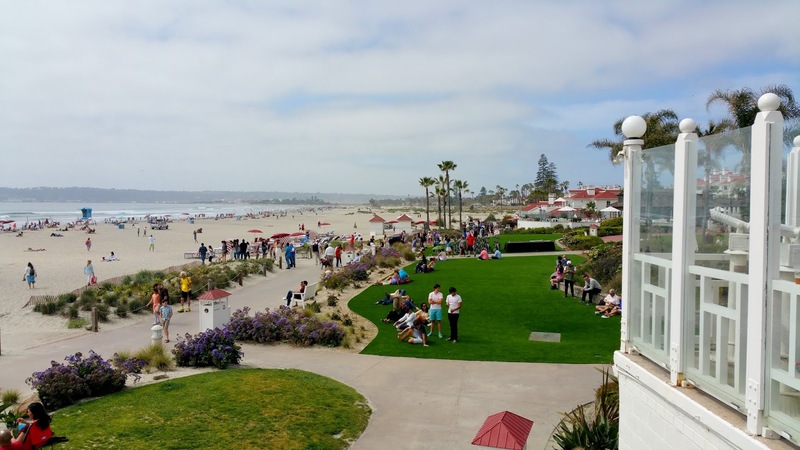 Hotel Del Coronado's beach area. Finally we found our way around to the Hotel Del's beach side where we settled under a patio umbrella and ordered drinks. Mine was a "Some Like It Hot" margarita. It was an $18 drink. I didn't notice the ingredient list included jalapeno infused tequila with sliced hot jalapeno garnish. Fortunately, the waiter exchanged it after I burned my lips, teeth, tongue, throat, stomach and intestines on the first sip. Wayne, Ernie, Pam and me (with my replacement drink). Our Easter celebration continued when we returned to the campground with sliced ham and rolls Pam had prepared for us. Neighbors Bonnie and Jim joined us and we sat outside until the cool evening air forced us in.